When a personnel at this mission is about to be stopped by a dilemma, you may kill your captive to prevent that. "If you need someone to beat him into submission for you, don't hesitate to call me." 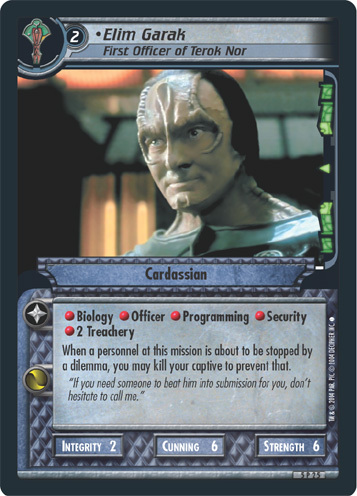 Characteristics: kill opponent's personnel, prevent your personnel from beeing stopped by a dilemma, affiliation, Alternate universe related, Cardassian species. There are 13 entries for Elim Garak, First Officer of Terok Nor (ST2E 5 P 25) at the Tradeplace (11 haves and 6 wants). Click here to see all trade list entries for this Promotion card! Also see here for all trade lists with any card fom "Fractured Time".